Q: How do you measure ROI – return on investment for B2B Trade Show Conventa? Measuring the profitability begins with the selection of target groups. More we are precise at this, better the return on investment. Another element are clearly defined goals, which each year we communicate very clearly with all stakeholders of the trade show. The return on investment is ultimately decided by the exhibitors and our key strategic partners. Given the continued growth in the number of exhibitors and an extremely low fluctuation, profitability of the trade show is satisfactory. Co-operation at Conventa is according to surveys that we do every year, an investment that exhibitors get back in the form of actual business. It is impossible to accurately measure the volume of these transactions and according to our information this is not measured by any trade show in the world. In addition to the business dimension we are also creating ROI through brand visibility and brand awareness for which we find that it is very well received in the market. Q: How do you measure the satisfaction of key stakeholders in the trade show? What you can not measure, you can not manage. Therefore, through targeted surveys among hosted buyers and exhibitors we are regularly checking satisfaction of key stakeholders. Over the years, they have become a trusted and valuable source of information for improving the quality of the project. The set of criteria has not changed and it allows us to track trends over time. In our experience on the satisfaction and measure of the performance of our trade show affects a whole chain of factors, but the most important fact is that the trade show is a space for the establishment of personal contacts. If we look at the statistics, only via one2one system at every Conventa some 2.800-3.200 meetings took place, lots of meetings also take place in informal meetings. This is certainly one of the key factors of satisfaction of stakeholders. Q: What is the share of public funding of Conventa trade show and what is the participation of the economy? The share of public funding of the trade show is just 8.7%. The trade show is mostly financed by the economy. Because of this the success of the trade show is crucial to provide an added value for the participating companies. One of the ways to ensure the stability and profitability of the project is to develop long-term relationships with key partners. It covers a variety of strategic partnerships, building of informal networks and co-operation with important partners in South East Europe. All this contributes to the improved performance of the project. Q: In what way do you perform quality control of implementation of the project? First, we try to provide a suitable environment for B2B communication. This includes little things such as ensuring an appropriate and pleasant booth for establishment of a personal relationship at the trade show. At the trade show we are creating business opportunities and because of this we are very carefully choosing the suppliers. We are devoting a lot of attention to this. Quality control is carried out throughout the preparation of the project through personal meetings with suppliers and through a survey of all stakeholders. After the project we complete personal meetings with about 50% of all exhibitors, where through conversation we are looking for solutions to improve as much as possible and we try to take into account the wishes of the exhibitors. To strategic partners each year, at a joint meeting we present the objectives and progress of the organisation of the event. 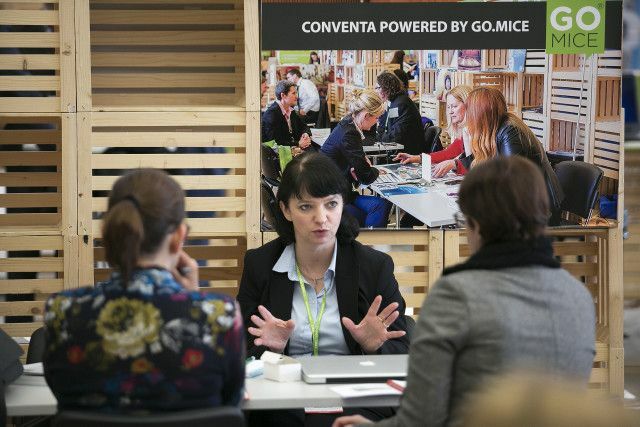 Conventa is a Central and Southeast Europen trade show for meetings, events & incentives. The Conventa way of doing business is based on the simple concept that face to face business interaction is the most effective way of imparting information, learning about the objectives of the planners, events and providing the platform for discussing the best way of concluding business.